The 2001 Mustang GT received upgraded wheels, valance mounted fog lamps, rear spoiler, interior upgrades, and 260hp 4.6L V8 engine. Laser Red 2001 Mustang GT with a 260hp (at 5250rpm), 281 cubic inch (4.6 liter), electronic fuel injected, single overhead cam, V8 engine. Mineral Gray 2001 Mustang GT convertible owned by Gary Horn from Salt Lake City, Utah. This was our featured Attitude Of The Week for the week starting January 16, 2011. It has a 4.6L V8 engine and an automatic transmission. 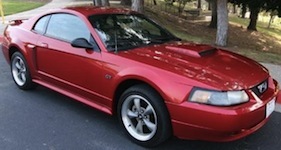 Gary tells us more, "I purchased my '01 GT convertible in June of 2008. At the time, it had 84k miles on the odometer. As of January 2011, it has 115k miles. It is completely stock other than the antenna (shorty) and the sequential tail lights. (LOVE EM!)" Zinc Yellow 2001 Mustang GT with a Vortech supercharged 281 cubic inch (4.6 lite) V8 engine. The exterior of this car has aftermarket cobra wheels and smoked headlight covers. Oxford White 2001 Mustang GT coupe owned by BJ Rider from Sturgis, Michigan. It has the 4.6L V8 and an automatic transmission. BJ adds, "I bought the car in Chicago back five years ago. I put Cobra rims on it. The car has flowmasters on it. It has been in the garage since I bought it - never seen snow or rain since I have had it. It only has 29,000 miles on the car. Yah, you read that right - 29,000 miles. The car is a blast to drive and looks and sounds sweet." Performance Red 2001 Mustang GT coupe, left front view. Tropic Green 2001 Mustang GT convertible with side stripes and black Bullitt wheels. The stripes are the same as the California Special models. The side fender scoops and hood scoop have been painted black. This red, white, and blue custom flag graphic colored Oxford White 2001 Mustang GT convertible was at the 2010 Mustang car show in Port Angeles, Washington.